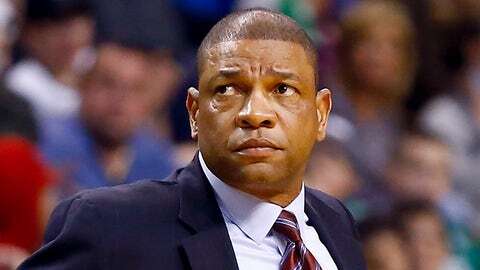 Some Celtics fans feel that Doc Rivers walked out on the team this summer. To those fans, Rivers would say: You’re right. "I did, at the end of the day," Rivers said Tuesday on Felger & Mazz on 98.5 The Sports Hub. "You make choices in life. It was a very difficult decision for me to make, whether to walk away and sit out a couple of years, which was another way I was leaning, or if the right job presented itself, to ‘walk away’ and do that. I was afforded a great opportunity here with the Clippers. This is the first time I’ve been able to coach and run a team. This may work. It may not work. It’s a far bigger gamble for me than anyone else, so I thought it was the right time to take it." Rivers helped orchestrate his departure from the Celtics last summer as part of a deal that originally would have sent Paul Pierce and Kevin Garnett with him to Los Angeles, as has been reported. The Clippers eventually sent a first-round draft pick to the Celtics as compensation for Rivers, but the NBA declared the teams would not be allowed to negotiate a trade involving the players out of concerns it would violate the league’s rule against side deals. While the Nets have been an unmitigated disaster thus far with Garnett and Pierce, the Clippers have been mostly successful despite some recent struggles. The Clippers lead the underwhelming Pacific Division with a 14-8 record but had lost three out of four games before beating the Sixers on Monday. Meanwhile, the Celtics are atop the Atlantic Division despite a 10-13 record, and Rajon Rondo stopped by Crowd Goes Wild this week to explain how first-year coach Brad Stevens is getting it done. Rivers makes his return to Boston on Wednesday, when the Clippers visit TD Garden.